"Unfortunately it has been too easy for anybody to take a photograph, trace it, and make a lousy painting. Photorealism, in that sense, has been bastardized. I can sympathize with a lot of people who just reject it outright, because, like anything else, there is so much bad stuff around. I always thought of myself as a Realist painter." "I enjoy painting because of all the things I can do with it. I'm not trying to make propaganda for New York or anything. I think I would tear down most of the places I paint." "The Trouble with Pop was that it made too much comment. A very sophisticated intellectual game type thing. You get tired of it very quickly. The joke has been made and that's it, you can't laugh forever." "I don't think my paintings have much emotion. They are rather straightforward. They have the emotion of the subject. Does a Monet water lily painting have emotion? Not really. It's just the water lilies. Very pretty. But emotion is not really what the painting is about." "A photograph is just values. It doesn't have line. When you use the photograph, you are using the values, but you are adding line and space and movement, coming from your own experience. That's why although I work from photographs, I like the subject to be things I'm really familiar with. I don't think I could use someone else's photograph of some place I've never been to and make a painting." "I think the popular concept of the artist is a person who has this great passion and enthusiasm and super emotion. He just throws himself into this great masterpiece and collapses from exhaustion when it's finished. It's really not that way at all." "I think the real test is to plan something and be able to carry it out to the very end. Not that you're always enthusiastic; it's just that you have to get this thing out. It's not done with one's emotions; it's done with the head." "It's been my experience that the paintings I've hated working on the most and have gotten the most bored with, really feeling were terrible while working on them, have ended up being my best paintings. The ones that I've had a real enthusiasm for, a real feel for, I thought they were masterpieces at the time but realize they are duds six months later." "I do feel an affinity with all realist painters; I don't really consider someone a painter unless the individual is a realist. I love realist painting no matter what it is, but it's certainly got to be a painting of something." "If anyone had shown me in 1965 what I would be painting in 1967 I wouldn't have believed it. I was just walking around the city photographing things, and that was what was there. It wasn't that I thought about it or planned it." Estes spent the first few years of his life in the small city of Kewanee, Illinois. He was the first of two children, and had a close relationship with his younger brother, Robert. His father, William, ran an auto repair shop in Kewanee. The family moved to Evanston, a suburb of Chicago, when Richard was a young child. He showed a creative streak from an early age, and particularly enjoyed drawing, taking photographs, and making models. He first began painting when he was in high school but wasn't yet convinced he wanted to be an artist. Instead, he planned to study architecture at the Illinois Institute of Technology in Chicago. He was drawn to the program as it would have provided him with the opportunity to study under Ludwig Mies van der Rohe, a pioneering figure in modern architecture alongside Frank Lloyd Wright and Walter Gropius. Estes graduated high school in 1950 and worked for an insurance company for a year. He saved enough money to travel throughout Europe the following year. During his travels, he was able to see cities and museums he had previously experienced only through books. While the trip prevented him from submitting his application for the Institute of Technology on time, the transformation he underwent, thanks to the cultural experiences he'd had in Europe persuaded him to study art instead. In 1952, Estes began working toward his Bachelor's in Fine Arts at the Art Institute of Chicago. He was drawn to realist painting and the Art Institute's works by Edward Hopper, Thomas Eakins, and early works by Edgar Degas were a major source of inspiration for his undergraduate artistic repertoire. Reflecting on his studies, Estes remarked, "I think one of the best things about being a student there was, for example, trying to do a figure painting and then going up into the galleries to see the way El Greco or Degas did it. You can really put your work in the proper perspective that way, and learn from the paintings." After graduating from the Art Institute in the summer of 1956, Estes moved to New York City, where he worked briefly for an advertising agency. Unable to make ends meet, he returned to Evanston in December of that year to live with his family and save money, while continuing to develop his art. 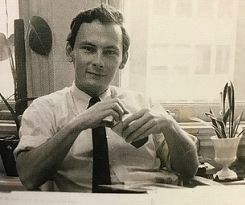 He moved back to New York in 1959 and for the next several years was employed as a graphic artist in publishing and advertising. His work appeared in publications such as Popular Science and he also took on a number of freelance jobs, including designing record album covers and book jackets. 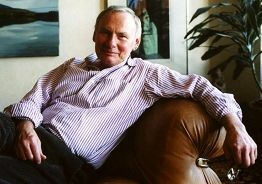 In a 1978 interview, he looked back on his work during these years, characterizing it as "nothing that took any emotional energy." However, he saw that as a positive thing. "That way I wouldn't be drained," he explained. "I really wanted to paint, and would save all my creative energies for when I got home... I worked during the day and painted at night." It was during that time that he developed the technique that would define his work: painting from his photographs of urban landscapes. Unlike his peers, Estes did not use a grid system or projector in order to translate his images to the canvas. His technical mastery and devotion to the traditional mode of easel painting sets Estes apart from other photorealist painters. Having saved some money from his commercial jobs, Estes again traveled to Europe in 1961 and 1962, devoting several months to sightseeing and painting. He took a freighter from New York to Copenhagen and then spent a month traveling through Germany and Italy; he eventually rented an apartment for four months in Palma de Majorca, Spain before returning to New York to continue his work as a commercial illustrator. By 1966, Estes was finally able to abandon his commercial work and pursue painting full-time. He began actively cultivating relationships with New York art dealers and galleries, an effort that culminated in him landing his first solo show in 1968. His debut exhibition of New York's urban landscape, complete with remarkably detailed renditions of reflections from windows and metallic surfaces, captured the attention of critics but his hyper-realistic style seems to have, through the years, made his work more a source of critical puzzlement than acclaim. His work was also praised by fellow artists, including Salvador Dalí. Estes's career then began to take off in earnest and in 1971 he received a fellowship from the National Council for the Arts and was elected into the National Academy of Design. 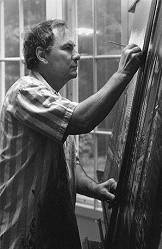 In 1973, Estes moved to a new apartment and studio near Central Park, where he remains to this day, living and painting. In the early 1970s, he began spending significant periods of time on Maine's Mount Desert Island, where his art dealer, Alan Stone, had a vacation home. 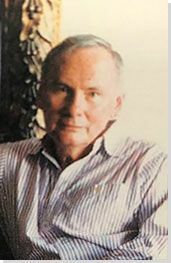 Initially, Estes simply wanted an escape from the oppressive heat of Manhattan in the summer, but he quickly developed a strong attachment to the village of Northeast Harbor, which has long been a summer destination for wealthy New Yorkers, including the Rockefellers and the Astors. When the former home of the American Impressionist painter, Carroll Tyson, went on the market in 1975, Estes purchased the property. He spent five years renovating the house and creating a spacious new studio. Once the renovation was complete, he began spending more of his time in Maine and expanded the subject matter of his painting to include more landscapes and seascapes. His paintings of Maine contrast sharply with the city views that established his fame, though they retain his trademark, technical precision. In the Maine works, there are no signs, no tall buildings, no telephone booths; instead, the emphasis is on natural beauty. Since establishing his place within the art world, Estes has divided his time between New York, Maine, and global travel. He visits Europe regularly and has also spent extended periods of time in India, Costa Rica, Morocco, Tunisia, and Japan. Further, his ability to work is not constricted by place. "If I were working like the Impressionists, on the site," Estes once said, "it would be different, but I'm working from photographs and sketches, and frankly it doesn't make any difference where I do it." In the 1980s and 1990s, he painted a series of famous bridges, among them, the Pont Neuf in Paris, London's Tower Bridge, the Ponte dell'Accademia in Venice, the Roman bridge in Cordoba, and the Brooklyn Bridge. In 1990, he produced a series of paintings based on his travels throughout Japan, which culminated in a successful traveling exhibition in Tokyo, Hiroshima, and Osaka. His detailed renderings of other cities have established Estes as a chronicler not just of New York, but of urban landscapes in general. His exploration of the intersections between manmade and natural beauty have also continued to expand, with a recent series focusing on over-the-railing views of boats in water all over the world, even in Antarctica. Estes continues to draw inspiration from New York City, most recently by creating small, detailed compositions focusing on subway windows and doors. Estes has been celebrated as a leading painter of American cityscapes throughout a career spanning more than fifty years. He is considered one of the founders of the international Photorealism movement of the late 1960s, alongside Duane Hanson, Chuck Close, Ralph Goings, and John Baeder. Estes's meticulous technique and articulation of the city as a symbol of American life has directly influenced the Superrealist paintings of British-American artist Malcolm Morley, Charles Bell's renditions of metal children's toys, and the digitally manipulated and enhanced images of Denis Peterson, which call attention to social issues such as homelessness and poverty. Estes considers this piece, which depicts a young man curiously peering out of the window of a Greyhound bus, to be his first mature painting. His work from the late 1950s and early 1960s had been an experiment in looser brushwork - something along the lines of the Realist paintings of the mid-19th century. He abandoned that style for his trademark hyper-realistic paintings in which paint is applied carefully and brushwork deemphasized to the point of being invisible - almost a photograph.